Don’t just take your kids along with you to the grocery store; actively involve them on the front end in meal planning. Let them help plan a menu and choose a recipe to follow so that they are participants in the meal preparation process. Have them take inventory of what is in your pantry or refrigerator so they know what ingredients are already on hand – then let them make a shopping list. If they are too young for that, let them help you decide what cheese or fruit to buy or help you make a simple, no-cook recipe like a fruit parfait with yogurt for a healthy dessert. Kids, like adults, like choices! 2. Go to the source. Don’t limit your grocery shopping to the local supermarket. Take your family to a farmer’s market or to visit a dairy farm. Pick berries together during the summer for a homemade dessert your child can serve to his or her friends on a Saturday play date. Plant a garden – tomatoes and cucumbers are “no fail” choices your child can plant and watch grow. Teaching kids where their food comes from helps make them more environmentally aware as well. 3. Make healthy snacks available. Your children will eat what you provide for them. If you buy healthy snacks rather than those with unhealthy fat and a high-sugar content, that is what they will learn to like. Putting those nutritious snacks on shelves where they can easily access them and keeping healthy choices available for trips in the car are also strategies that make healthy eating easier. Good choices are peanut butter, low-sugar applesauce, any kind of fresh or dried fruit, sliced vegetables, whole grain crackers, nuts and bottled water. And don’t forget the importance of drinking lots of liquids. Your child doesn’t have to just eat five servings of fruits and vegetables a day, he can also drink them. Smoothies and mixed fruit drinks can be a fun way to introduce new fruits and serve as a healthy snack between meals. 4. Don’t give up when introducing new foods. Studies show that most children may need between 5 and 10 exposures to a new food before being willing to try it. If you plan family-friendly meals and let your child pick and choose from what is on the table, your chances for success will improve. Try to include a variety of options – some foods your child really likes as well as some new foods to try. Remember to be a role model for your child and sample some of everything and your child will learn to do so as well. And, remember – don’t give up the first time your child rejects something! 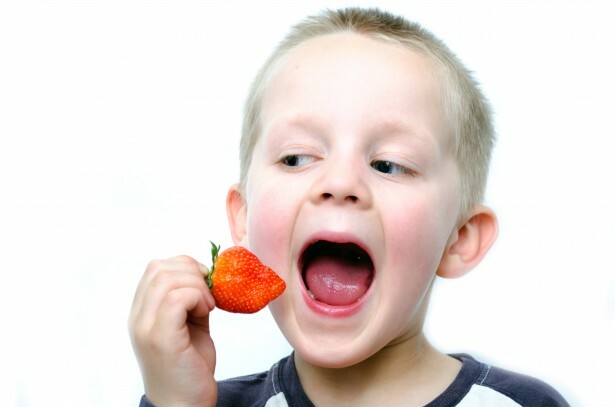 Studies have shown that children’s food tastes are highly correlated with foods that their mothers liked or disliked. If you order a healthy salad and drink water, even if it is at a fast food restaurant, your child is more likely to do the same. In a health study published in 2004 by Oxford Academic, researchers found that “a positive parental role model may be a better method for improving a child’s diet than attempts at dietary control.” In other words, rather than telling your child “no” relative to his or her food choices, model positive food choices yourself. Use meal and snack times as teachable moments to help even the youngest children make wise food choices. Remember that as a parent, you are the #1 teacher of your child. Much of what you teach them is transmitted through your actions more than your words. The choices we make for ourselves as adults, and what we model for our children, create lasting impressions that stay with your child way into their own adulthood. Stressing the importance of healthy eating habits for your family and for yourself encourages lifelong patterns from which both you and your children will benefit!